This screen can be reached from the Timeline View, or the Display Object Properties box (click on the "Time:" label text). 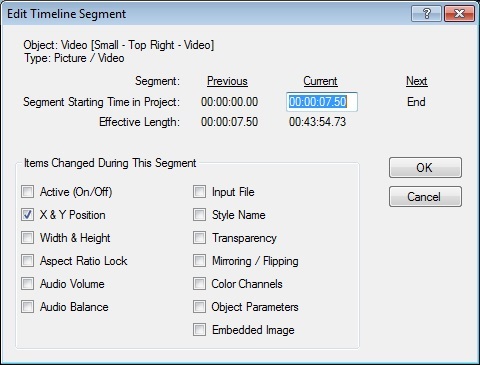 Segment Starting Time in Project - This displays and sets the starting time in the project for the current timeline segment. Changing this value will affect the lengths of this current segment and the previous segment. Setting it to a time index before the previous segment's starting time, or after the next segment's starting time, will change the order of segments, and therefore the order that the changes are applied in the project. However, the first segment cannot be rearranged; its starting time and effective lengths can be changed, but it cannot be moved after another segment or have another segment placed before it. This restriction only applies to the initial segment; all other segments can be rearranged. Items Changed During This Segment - Indicates and controls which Display Object settings are changed during this segment. If an item is not checked, the corresponding configuration setting will be inherited from the segment that came before it. If an item is checked, a new instance of that configuration setting will be used for this timeline segment. The Object Parameters item refers to the specialized group of settings that is specific to each type Display Object. Any changes made during a timeline segment will automatically update these checkboxes and will be applied starting at that timeline segment. To make changes that affect all segments, make them on the very first segment, and then use this screen on the following segments to ensure that they inherit the desired settings.